Tanimbar Scrubfowl, Tanimbar (Dusky) Cuckoo-dove, Wallace’s Fruit Dove, Rose-crowned Fruit Dove, Pacific Emerald Dove, Elegant (Blue-tailed/Yellow-eyed) Imperial Pigeon, Pink-headed Imperial Pigeon, Pied (Little) Bronze Cuckoo, Varied Goshawk, Australian (Moluccan/Lesser) Masked Owl, Tanimbar Boobook, Cinnamon-banded Kingfisher, Tanimbar Cockatoo (Corella), Blue-streaked Lory, Red-cheeked Parrot, Eclectus Parrot, Great-billed Parrot, Elegant Pitta (the white throated form, vigorsii), Banda (Scaly-breasted) Honeyeater, Banda Myzomela, Tanimbar Friarbird, Tanimbar Oriole, Moluccan (Golden) Whistler, Wallacean Whistler, Wallacean Cuckooshrike, Tanimbar (Black-browed) Triller, Charming (Long-tailed) Fantail, Supertramp (Arafura) Fantail, Cinnamon-tailed Fantail, Tanimbar Spangled (Wallacean) Drongo, Tanimbar (Leotoe/White-naped) Monarch, Banda Sea (Black-bibbed) Monarch, Broad-billed Monarch (Flycatcher), Torresian Crow, Tanimbar Flyrobin, Ashy-bellied White-eye, Tanimbar Bush Warbler, Tawny Grassbird, Tanimbar Starling, Slaty-backed Thrush, Fawn-breasted Thrush, Tanimbar (Rufous-chested) Flycatcher, Salvadori’s Flowerpecker (Mistletoebird), Tricoloured Parrotfinch, Five-coloured Munia. The main road north of Saumlaki contains patches of forest. At KM22 is a small streambed with a small cover of native forest situated in cultivated land, plantation and secondary scrub. It doesn’t look like much, but the majority of the endemic birds and regional specialities can still be seen around this spot. 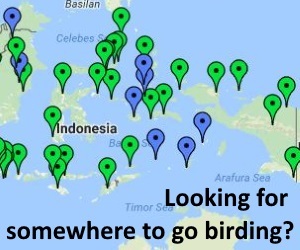 Highlights include Fawn-breasted Thrush, Slaty-backed Thrush, Tanimbar Boobook, Tanimbar Cockatoo & Blue-streaked Lory (the latter two probably overflying only), Wallace’s & Rose-crowned Fruit Doves, Tanimbar & Banda Sea Monarchs, Tanimbar Flycatcher, Tanimbar Bush Warbler, Cinnamon-banded Kingfisher, Pied Bronze Cuckoo, Tanimbar Cuckoo-dove, Wallacean Whistler, Elegant Pitta, Tanimbar Flyrobin, Tanimbar Friarbird and its mimic Tanimbar Oriole, Tanimbar Starling and Tanimbar Spangled Drongo. In the grasslands nearby Tawny Grassbird is possible. Another patch of degraded, logged forest along the main road north of Saumlaki. Again, the majority of target birds can be found here. Fawn-breasted Thrush has been seen foraging on the first km of the track at dawn. The deeper you get into the forest, the better it is for Parrots and Pigeons. If you get far enough away from the roads, you may even be lucky and see Tanimbar Scrubfowl, perhaps the hardest of the endemics to see. Back on the main road, and north of the the old logging track the main road rises to a viewpoint, where you may be able to scope for parrots and pigeons. This road is recently paved (and should be finished by now, unless they ran out of money…). Whilst there is extensive ongoing logging activities, there are better accessible forest patches down here, particularly towards the western end of the road. All Tanimbar endemics should be possible along this road, and other good species including Tricoloured Parrotfinch and Five-coloured Munia. Try exploring any tracks heading away from the road into what is left of the forest. Roadside vegetation is still good however, and many of the specialities can be seen along the road, including Tanimbar Bush Warbler, Fawn-breasted Thrush, Parrots and Pigeons and Cinnamon-banded Kingfisher. At night Tanimbar Boobook and the Tanimbar form of Australian Masked Owl are both possible down here. The town of Saumlaki provides opportunities to see some of the commoner endemics in patches of mangrove, scrub and trees around its edges. The coast provides opportunities to see various waders and assorted waterfowl, with an Australasian influence evident. Patches of dry grassland can hold Australian Pratincole, Little Curlew and maybe also Oriental Plover. The old airfield is one place to look. Getting to Yamdena is straightforward from Ambon, with at least two daily flights at present. There are now a number of hotel choices in Saumlaki at the southern end of the island, all along the main road. Options for car/diver hire can be arranged through your hotel, otherwise there is also a motorbike/scooter hire along the main road. 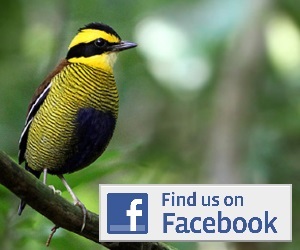 Getting to the main birding locations along the road heading north and the Batu Putih road is fairly straightforward, the newly paved roads are in good condition and the sites are not that far away. With your own transport sorted it is possible to try a number of the sites or any roadside birding and trail heading into suitable habitat along either of these roads. The old Saumlaki airport is at the southern edge of the town.